Mounts to 19.5” diameter by 6.75" wide, dual-rear-wheel, 4 hand hole, 8 lug on 275mm bolt circle, 20mm lug stud applications. Phoenix USA Inc. 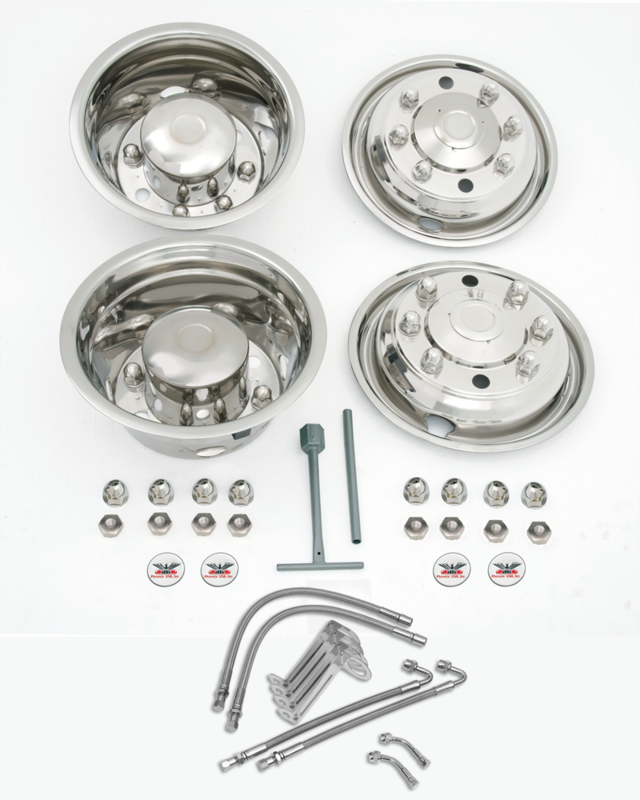 DOT over-lug, bolt-on, stud mount wheel simulators with polished stainless steel finish. Front simulators dish out and rear simulators are deep dished to contour with the wheel. Front pop out centers allow access to hubs. Set of 4 wheel covers including mounting hardware, installation tool, instruction sheet, and AMG1 Air Max braided stainless valve extensions for inner and outer rear wheels. Air Max valve extentions mount using the jam nuts holding on the wheel cover.